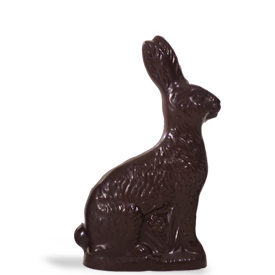 Not too big, not too small, our eight ounce Easter Bunny is just right for your basket! This bunny is a full eight ounces of solid Swiss dark chocolate. Standing just under six inches tall, this bunny arrives Easter Basket ready in a clear gift box with a silver bow.